I don't need a sign to tell me this is garlic, but I am grateful to tell everyone else it is. Can a fellow grow too much garlic? On the coast, our winter plantings can continue right up through March. The only months that are really hard on winter veggies as close to the Pacific as we are in Zone 24 is July through September. In some years, October can be hard to handle too, but this year's one week or so of very hot weather is much more common. It was hard on our lettuce and young plants in the garden, we had to add some extra water by hand. And we did loose a few. But now, by this time of the year, we ought not have any extended heat spells, the cool weather should be very much ensconced. Now we want to make certain I have a good stock of alliums laid in – my garlic, onions, leeks and shallots all have a place in my heart – and stomach – so I plant a lot of them. Shallots and garlic can be grown from bulbs, so I will plant them in pots and I crowd all my roses with garlic. 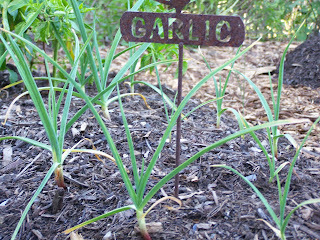 Garlic is a good companion plant because, according to folklore at least, it is good at discouraging insects. I’m not sure this is proven yet, but I think the garlic plant itself is worth a look so I love having that upright element in pots as well as in ornamental beds. And you can't really plant enough garlic and shallots. Come to think of it, leeks would serve that purpose just as well. This year, I am in my second year of planting onions and shallots from seed. Last year, shallots were a whopping success – except I felt completely out of my league when it came to cook them. I felt I had to copy a French accent while cooking with them. The onions ran a distant second, which saddened me – I am much more familiar cooking with onions than shallots. But, I'm trying again. I have loved to purchase onion plants from Peaceful Valley Farm Supply for several years. They carry several different varieties, but the one I love is Italian Red Torpedo Onions. But for the last two years, I have missed getting plants because they do sell out. So, in revenge, I have sought to start them from seed. The plants you can buy in nurseries are really only baby plants that someone had to start from seed, so someone had to do it. I figure if someone can do it, I just as well ought to be able to do it. It's harder than I thought. The little plants come up looking like grass and seem to take forever. Maybe that's why buying plants is so hot. Water, hopefully becomes much less of a challenge by this point, although a Santa Ana might come flying through and send everyone scrambling to keep the soil moist around my plants. Mulch. The more the mulch, the less the work. You can mulch pots too – in permanent (more or less) plantings like a rose, caper bush or bay leaf tree. Mulch is a term that I use a lot, but needs to be defined. Mulch is anything put on top of the soil that interdicts the sun's rays and raindrops (or 'sprinkler-drops') from hitting the soil. It can be rocks, sheets of plastic, or some organic material – even compost. As a vegetable gardener from way back when, I disdain the non-organic mulches. They can be expensive and they don't do a thing for the soil. Most organic mulches are cheap and many can be found for free. Organic mulches, unlike rocks, plastic or other non-organic mulches, feed the microbes that live in the soil, which improves the soil and adds fertility without a lot of extra expense. As I plant more of my winter plants, I'll keep adding more compost as mulch around the base of my plants. One thing to take note of as the days get cooler and hopefully wetter, is an explosion of slugs and snails. This is the kind of weather they prefer and they multiply like crazy in it. Because they are migratory creatures, you can never be rid of them completely. If you did manage to clear your garden on Tuesday of all slugs and snails, by Wednesday evening, you have a whole new group on hand that wandered in from the neighbors (or hatched out while you weren't looking). The only real solution is constant vigilance. I have a friend who walks through her garden with a pail of water with dish soap in it and every snail and slug goes for a swim. Another friend tosses them towards the street. Another crushes them underfoot. (Gardening is not for the squeamish or faint of heart!) I do all three at different times depending on how I feel. You should have seen how I felt to loose four rows of baby lettuce in one night. I never found that culprit, but I have wrecked revenge on every slug and snail I've ever seen since. Yes, there are predatory snails that feed on the common garden snail, but they are also migratory and seem like a pretty iffy proposition to me. Besides, if they ever did take out your common garden snail and left themselves with nothing to eat (not very likely) then they would turn on your garden as well. Seems like that is a lose lose lose situation. I'll pass. There are also several products in the marketplace that work and are organic. Es-car-go® and Sluggo® are two products that are organic and safe around pets and other wildlife because the active ingredient is an iron phosphate, a soil component that is lethal to mollusks like snails and slugs. Still, the least expensive way to deal with them was to kill them directly as mentioned above. I imagine if this makes you queasy now, after some valuable crops or hard work becomes a midnight snack several times, you will find yourself a hardened snail murderer like I am. This is also THE very time to begin to think about fruit trees. I urge you to think about fruit trees for a while before making the dive because they are a big investment, not so much in money, but in time and patience. Once one has planted a fruit tree, some will take several years to come into full production – if you find the fruit unsatisfactory, or you have a variety that doesn't fruit well for you, all that time is wasted. Gather as much data as you can in order to choose the tree that is right for you. Here are some sources you will find helpful – I suggest you go online and order the printed catalog because you'll want to cross check facts and types with each different nursery before you commit. Trees of Antiquity, is the place where we purchased most of our trees here in The Learning Garden. I found them extremely helpful and very knowledgeable. It was they who suggested Dorsett Golden as our apple here and it is truly one of the finds of a lifetime for our area. Raintree Nursery, invariably is where I place my ongoing orders for my propagation class (that starts in January) because I need rootstocks for the class, but their selection is lovely too and their catalog is worth a read. My old standby, Peaceful Valley Farm Supply, is a great supplier of trees and fruit bushes, but their selection isn't nearly as complete and their catalog isn't a detailed as these others. Still, if you are already ordering something from Peaceful and they have the variety you want, you can't go wrong with them. Dave Wilson Nursery has one of the most extensive websites around on fruit trees. It is really worth a good solid look, chock full of data. 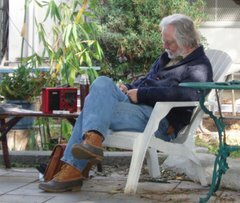 The University of California has gotten in on the act with a website, The California Backyard Orchard, that is a wonderful web site for a lot of answers about growing fruit trees in our climate. It also promotes the UC ANR publication, The Home Orchard which I recommend if someone is going to go into this head over heals – like I want to! The Home Orchard, Ingels, C. et al, © 2007, University of California, Agriculture & Natural Resources One of the very best books for learning about the home orchard. Well written, easy to understand, good photos, this one has it all. No shortcuts, I like this book. It is available through the address above (and on sale as of this writing – which means a new edition might be on its way out – because of the sale, it is cheaper from ANR directly than it is from Amazon). Dorsett Golden – as mentioned above, is our heavy cropper. It takes about 3 years to really settle in (although it will bear fruit, they are tiny for the first three or so years with full sized fruit beginning to show up in year three). We have Dorsett Golden on half size fruit stock and it's a fair sized critter. Gala – we have this on a dwarf rootstock – she's about five feet tall at this point and not likely to get much larger. Lovely apples with crisp texture and that is what I prize in an apple. Fuji – one of my all time favorites, but the one we have in the garden is a 500 chill hour plant and in three years I harvested one small apple. It WAS good, but it wasn't worth all that time. Sadly, ours will have to be replaced. (There are newer Fuji trees that have less chilling requirement and I may buy one of those. If I had known better, I would have planted more varieties with a wider range of fruiting times to extend the harvest – as it is now, we get a ton of apples in late June/early July and then we are done for the year. Although, a quick look at the literature I have at hand shows that I have few apples to choose from that will fruit here at all. Gold Kist – hands down, the best apricot I have ever eaten! A self-pollinated variety, this one tree stands out as the best fruit in our garden. While Royal Blenheim is the touted variety for our climate, I just love Gold Kist and have no desire to look beyond it. Seckle is usually the only one suggested for our area of the European pears. We have one, but it ended up in a neglected area and I've got nothing to report. Although, I don't think a ripe pear can be beat by much for shear hedonistic eating! Violettte de Bordeaux – is our tree that has been a champion for five years. It bore fruit the first year and it has not stopped since. A deep black skinned fruit, the flesh is a gorgeous red and has a smoky richness that is heavenly. White Genoa – is an Italian variety that took forever to fruit. Once it finally put on a crop by which it could be judged, I began to appreciate its lighter and sweeter amber flesh. A really lovely fig. Double Delight – not to be confused with the rose of the same name, this is a yellow fleshed freestone nectarine, heavily bearing and needs a LOT of thinning – we almost lost several branches because it just over set fruit. I know Peaceful Valley calls it 'sensational' but I think that's a little over the top. It's good and with vanilla ice cream it's really good. But not 'sensational.' It is self-fertile. Santa Rosa – this is one of the thousands of plants that Luther Burbank created (he lived in Santa Rosa and gave us the Burbank potato, the Shasta Daisy among thousands of others), and I find this to be the best and most prolific producer of any tree in our gardens today. It makes a fabulous sorbet, delicious jam and fresh eating cannot be beat. There are several other plums that will do well in our region, but I haven't got past this one. This is just the highlights of the common fruits. I will take on some more later in the month. Can you just plant bulbs of garlic that you pick up from the farmers market? Yes. Break the bulbs into their individual cloves, plant just below the surface of the soil - for those of us in frost free areas. The sooner you can get these in, the larger your cloves will be at harvest.